← Random Panel: Why do I get stuck in line behind this guy EVERY SINGLE TIME?! The winner of Caption Contest 25: Clown Town is ... Jose Inoa! 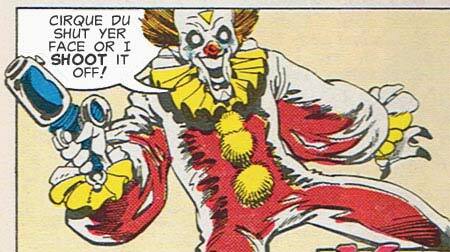 Kaiju: In soviet russia, clown laughs at you! Ian: You want a balloon animal? I’ll make you a frickin’ balloon animal! JonnyDemon: Go ahead punk, call me Ronald again. Aulianas Telus: Buy a Big Mac. NOW. DJAdmiral: I’m going to make this a birthday you’ll never forget! Jose wins his own free custom black and white illustration of whatever he likes. Check back in a bit for Caption Contest 26, and your chance to win!